Maps that are suitable for use with TMJ-Mobile must be in the WGS84 projection in order to match the coordinate system of the data received from the GPS device. WGS84 is a good system for describing locations on a global scale. However, most large-scale printed maps are created in a coordinate system/projection format which is specific to that location. In the UK pretty much every map is plotted in the Ordnance Survey National Grid system. This includes all Ordnance Survey maps (Landranger, Explorer, MiniScale, SuperPlan), AA Road Maps, A-to-Z Streetmaps, Collins Bartholomew Streetmaps, etc. 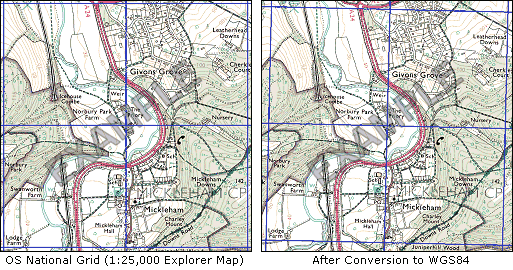 If you have a JPEG or PNG map image file in the OS National Grid system the TMJ Ordnance Survey Map converter can be used to convert it to a WGS84 system. The utility is written in Java so will need the latest Java Runtime installed on your machine (available for free from here). Extract the zip file to a folder on your hard drive and double-click the 'Start OS Converter' file to start the program. Your original map must be either a 24-bit JPEG or 8-bit 'indexed-colour' PNG file. If you are scanning a printed map it is essential that it is cropped/rotated so that it is exactly rectangular (the OS grid lines must be perfectly horizontal/vertical). 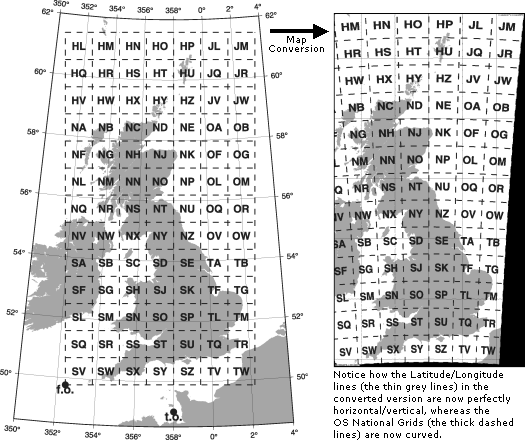 Enter the precise OS Grid Coordinates of the Bottom Left and Top Right corners of the map. Alternatively enter the Eastings and Northings of the Top, Bottom, Left and Right map edges. Click the 'Select Input Image...' button to locate the OS map file. Select a name for the Output Image (this will default to a name including the new Latitude and Longitude extents of the image - it is recommended to keep these for future reference). The conversion process will then begin. Note that large maps can take some time to complete. The new map image file can now be converted to a *.tmj file for use in TMJ-Mobile using the Map Organiser. If you are using very large maps you may need to run the 'Start OS Converter (1GB)' file, which allocates the program more memory for image storage. This utility is released under the GNU General Public License and contains sections of code written by Jonathan Stott (www.jstott.me.uk). Under the terms of the GNU/GPL license please contact us via the feedback form if you would like to view the program source code.